CHARLESTON, S.C. — Although Charleston is known for its Low Country cuisine, such as shrimp and grits, oysters, she-crab soup and corn pudding, a kind of renaissance has been emerging in this charming Southern city: the growing popularity of craft beer breweries and micro-breweries. 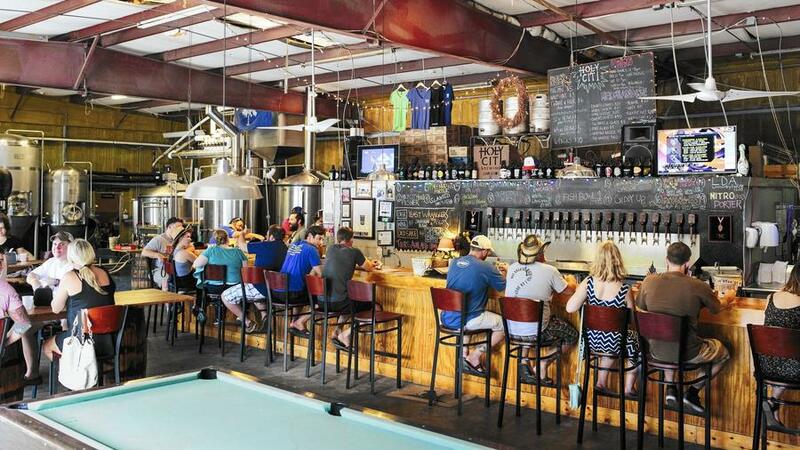 It’s been a slow process, but now nearly a dozen craft beer breweries call the Charleston area home, including in nearby North Charleston, Mount Pleasant and James Island. Many changes on the craft beer scene have been due to fairly recent changes in state law. Prior to 2007, noted Becca Lesesne, owner of “Original” Pub & Brewery Tours of Charleston (www.pubtourcharleston.com), it was illegal to manufacture or sell any beer in South Carolina over 6 percent alcohol by volume. Since some of the most interesting styles of beer are naturally higher, “this placed rigid constraints,” she said. Lesesne started the “Original” Pub & Brewery Tours of Charleston in 2009, putting together an “English-style pub tour combining history, beer and beer history.” Today she offers a walking tour of historic pubs and taverns in the French Quarter, the oldest part of town, and a brewery bus tour that visits three local breweries for tastings and a behind-the-scenes tour of brewing operations. She also organizes customized group events and an annual Holiday Pub Crawl that raises money for local charities. Visitors can sample local craft beers for themselves from Sept. 13-15 during Charleston Beer Week (www.charlestonbeerweek.com) and at the Southern Living Taste of Charleston (Sept. 25-27) at historic Boone Hall Plantation, a 140-acre farm on the outskirts of town (www.charlestonrestaurantassociation.com). The latter festival also features Low Country fare from casual and fine dining restaurants. Eat, drink and be merry on Charleston's only ORIGINAL European-style pub tour and drink local beer!! Covers about 4 to 5 pubs within about 10 city blocks of the oldest part of the city. Come explore history through Charleston's most historic taverns and pubs. Sample traditional appetizers, Southern cocktails, and local craft brews while hearing tales of pirates and bootleggers from local guides. It's the ONLY way to tour the city........because there's beer. Reservations required. Call us at 843-577-5535 to book a tour!